As Python’s popularity is on the rise, it might be high time to become familiar with both the job responsibilities and average Python developer salary in the US. A Python developer is usually responsible for writing server-side web application logic. This also includes the development of back-end components, connecting the application with other third-party web services, and supporting the front-end developers by integrating their work with the Python application. Speaking of Python, it’s also worth mentioning Django (an advanced open-source framework written in Python), which many software developers choose to specialize in. Even though data analysis and web development are still the major use cases for Python, machine learning is making a strong showing. This is according to the results of Python Developers Survey 2018. That’s precisely why this programming language gets more and more attention these days. It might eventually influence the average Python developer salary. In fact, Python already ranks as the world’s seventh most popular programming language among professional software developers. As a result, it has recently become one of the most wanted technologies. 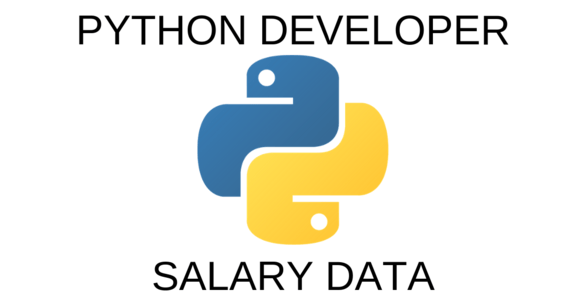 Python developer salary, however, depends on a range of factors. These include skill set, level of expertise, and location. To give you a full understanding of what affects the salary, we’ve combined up-to-date, industry-specific data from credible sources, such as PayScale, Glassdoor, and ZipRecruiter. 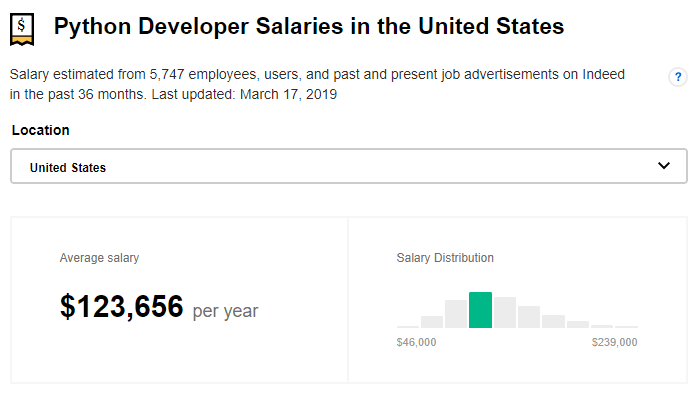 According to PayScale’s data, the average Python developer salary in the US is $77,362 per year (at the time of the publication). At the same time, the median hourly rate is $30.25. Interestingly enough, the average Python developer salary reported by Glassdoor is higher. It shows that the average base pay is $92,000 per year. The data from Indeed.com is even more surprising. It reports much higher salaries, with an average of $123,656 per year. Yet, ZipRecruiter sees annual Python developer salaries as high as $164,000 and as low as $54,000. The average is $111,896 across the United States. Coming up with data storage solutions. While the senior Python developer earns $122,093 on average. The preferred framework the developer uses also makes a difference. Django is one of the most popular Python-based frameworks. This might be the reason why average Django developer salary is $115,882. The location also matters when it comes to Python developer salaries across the US. Similarly to other jobs, pay differs from state to state. The national average may not be enough to judge how much a Python developer actually makes. According to PayScale, software developers who are familiar with Python should head to California. This seems to be the best-paid American state for these kinds of software engineers. The smallest paychecks, on the contrary, can be found in Atlanta. Surprisingly, PayScale doesn’t mention New York and the Python developer salary in NYC. According to other sources, such as Indeed.com, the city still ranks high in terms of salary. Plus, it seems to have plenty of open Python positions. Still, Python developer salary in NYC is lower than in San Francisco or Los Angeles. No wonder California is said to be the fastest to add tech jobs. The list of skills important for a Python developer includes, above all, core Python. Added to this are a knowledge of web frameworks, object-relational mappers, multi-process architecture, and RESTful APIs. Other programming languages like Java or C++. Python is already one of the most popular and highest-paying programming languages around the world. At the same time, Python Developers Survey 2018 results point out that 21% of Python developers are concentrated in the US. With high average Python developer salaries reported by various sources across the US, though, it’s only a matter of time before Python becomes a top choice for American developers.